“David is one such individual. 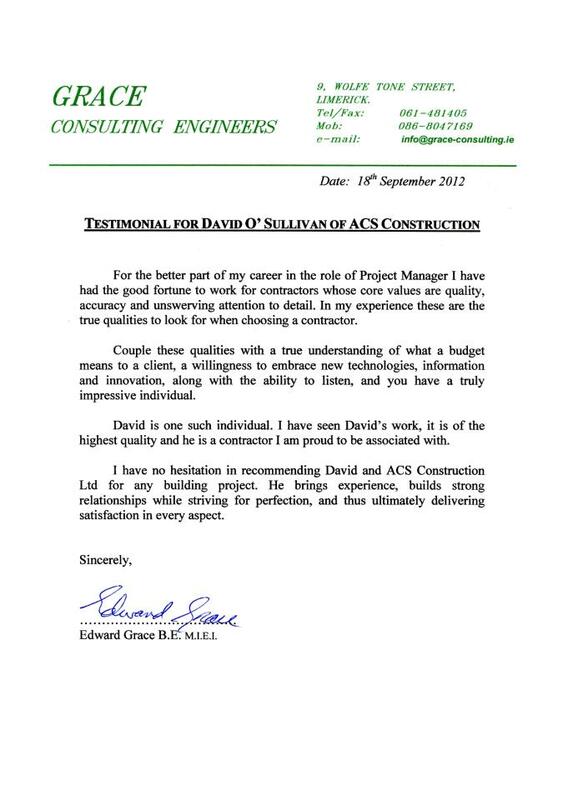 I have seen David’s work, it is of the highest quality and he is a contractor I am proud to be associated with. 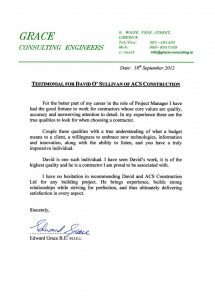 I have no hesitation in recommending David and ACS Construction Ltd. for any building project. He brings experience, builds strong relationships, while striving for perfection and thus ultimately delivering satisfaction in every respect.” – Edward Grace B.E. M.I.E.I. “David and his team at ACS Construction, designed and fitted out our new offices. Included in this project was the creation of internal meeting rooms & glass partitioned walls. The ACS Construction team completed the job quickly and to the highest quality. Thanks to ACS Construction, our new offices are now the perfect working environment for our digital marketing production team. 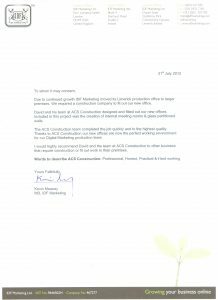 I would highly recommend David and the team at ACS Construction to other businesses that require construction or fit out work to their premises.” – Kevin Meaney. MD, IDF Marketing. 31st July 2012. I have had reason to contract the services of David O’Sullivan of ACS Construction Ltd. for work required on our family home. David was great, he arrived when he said he would, himself and his team left the place spotless each evening and they were lovely to deal with. No job was too small, indeed David appeared interested in discussing even the tiniest of tasks to ensure he understood what we wanted. David is very reliable, friendly, efficient, and professional. I recommend him without hesitation to all. – Nicole O’Neill, Castletroy, August 2012.